Note from the Webmaster: Exact location unknown. It has been torn down since. Note from the Webmaster: The second caption, appearing near the climax of the movie, was located close to the railway station. This is very interesting where in the heat if the night was flimed. It does have a southern feel to it. I love the film. I used to load railroad cars at that station with sacks of alfalfa meal when I was in High School. The little store across the street sold us Cokes in glass bottles. The lady kept close track to make sure we brought the empties back. That was in 66 or 67. 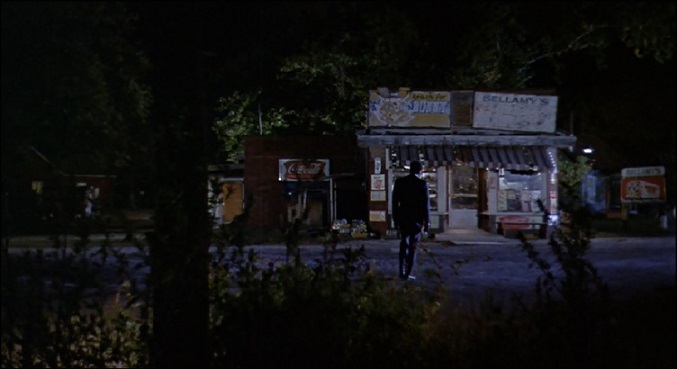 Location #1: I remember the eatery on the north edge of Freeburg. It was there for many years and was quite popular back in the day – I believe it was called “Jeanie’s Cafe.” The was pre-Interstate 64, so Route 15 (also “State St.” in Freeburg), which it was on, was a major thoroughfare. Peabody Coal’s River King Mine (strip and underground mines) were just a mile or so down the back road, and were huge employers back then. That was a busy area. The rotted, abandoned cafe sat like an old ghost for many years on that corner until it was finally demolished. Approx. year the café was torn down??? When I was in grade school back in the mid/late 60’s….we always traveled thru Freeburg (from St. Louis/Florissant) on our way to my grandfather’s who lived in Nashville, IL I actually can remember that little café stand. It looks like all that is left is an entry sign as you pull in the first entry coming (from) Freeburg. It’s hard to make out but it’s a wooden fence type sign now painted white with the words “Village Market” which you can barely make out instead of the yellow/red stripe sign in the movie. Pretty sure it’s the exact sign just painted over. I was there 2/13, the movie was on T.V. also 2/13 on KPLRTV. My very favorite movie because of the proximity to St. Louis. Headed to Sparta this weekend to view the other filming sites……. neat stuff ! I have heard that the train coming at the camera at the very beginning of the film was actually a night train that was pulling out of St. Louis. But it was made to leave the impression that it was travelling through the rural south. Entirely possible because Sparta, Illinois where it was actually filmed was close by on the other side of the river in Illinois. Not right next door, but not that far outside of what is generally thought of as the St. Louis metropolitan area. From a GM&O Railroad site: “A GM&O EMD E7 and passenger cars were featured in the 1967 film In the Heat of the Night. Although the film’s opening and ending shots of the GM&O are implied to be in a fictionalized version of Sparta, Mississippi, GM&O had ceased all passenger service south of St. Louis, Missouri eight years before filming was done in 1966. The actual filming location was Sparta, Illinois. The location where the GM&O locomotives and cars were filmed was in Sparta Illinois also. The train was leased from GM&O with a train crew to comply with union and operating rules of the road. The train came from Metro St. Louis, Missouri and traveled south along a GM&O right of way towards Sparta Illinois. At the time of filming, GM&O had not merged yet with the Illinois Central Railroad. The opening scene of the film shows the train crossing a main street in Sparta at night with the bright headlamp on the lead engine approaching town from an overhead shot. This was done using a scaffold across the tracks. This scene shows Virgil detraining and entering the depot station. The train was then driven south to an available turntable and parked for the night turning the engines around for the return trip to Sparta to shoot the final scene which was shot the following day and was among the final scenes of the film showing Virgil boarding the train and saying goodbye to Gillespie. As the train leaves Sparta, a close up shot of Virgil riding in a passenger car was taken by helicopter as the train travels the opposite direction with the scene expanding the view showing it meandering through the countryside as it leaves Sparta.” The railroad station still stand in the same location and apprears to be in good shape. Jesse’s garage was South of Sparta on Route 4. It was on the left side as you are traveling South out of Sparta. I believe it was Baue’s garage. You can still see part of Jesse’s garage but it is very faded. Does anyone know what scenes might have been filmed in union city , tn ? A local photographer has just recently found a photo from a past photographer in dyer county that actually took a photo of some of the cotton field workers at sometime during the cotton field part that was filmed. The chase scene was filmed on and past the Country Club Road and viaduct in Sparta, Illinois. This road intersects just North of the former train roundabout, where Tibbs gets cornered by the angry gang and saved at the last minute by Gillespie. I’m not sure about any scenes filmed in Alabama, but would be interested in more details of your locations Marti. My dad and I were the first to know about the filming of In The Heat Of The Night. We were at the feed store directy across from Hendersons. The feed store was owned by Brother Burns the mayor of Sparta, Illinois. It was almost closing time when he told us about the film crew coming to town. The next day I went to school (Sparta High) told everyone and no one believed me. A few days later here they came. Myself, my dad and sister were all extras in the movie. They moved us out of our house installed huge light bulbs for a backdrop. When Sidney goes to Rod Steigers house our house is the bright light directly behind him. They also wanted to use my parent’s car in the movie a 1964 black Pontiac Bonneville. Too bad car was in shop having ignition switch replaced. My mom got a call from Norman Jewison directly at the hospital where they worked. This movie brings back good memories especially when I see Warren Oatds. The shirt he was wearing when he was accused of the murder was the same shirt they gave my dad to wear in the movie. Unfortunately due to this they had to cut my dad from the movie. My dad passed away two years ago but when I watch this movie I know where we were standing during the filming. I forgot to mention that when we went to Detroit we got to see the movie at the cinema. It was pretty neat because when I got back to Sparta I got to tell everyone about movie. I still have my mother and one light bulb from the house. One more thing that I forgot to mention. The hoodlum in the leather jacket with the shovel was a friend that taught me how to sboot snooker at Lemon’s pool hall. Lots and lots of memories. Joseph, this is very very intersting what you are telling us here. Are you still in Sparta? And wouldn’t it be cool to bring all the guys like Poitier, Jewison, Anthony James back to location to celebrate a In the heat of the night revival? That had to be filmed as document of true movie history! If you want feel free to contact me. Very interesting post, lots of new information for us. Spent the night at a B&B in Sparta called “Moody Manor” a large brick home built in the 1860’s. The home is shown as Warren Oates drives by it at the beginning of the film. The restored train depot has a whole section inside devoted to the film and is now an art gallery. The bench where Gillespie and Tibbs sit and talk at the depot is gone but my wife took a pic of me standing in the exact spot. 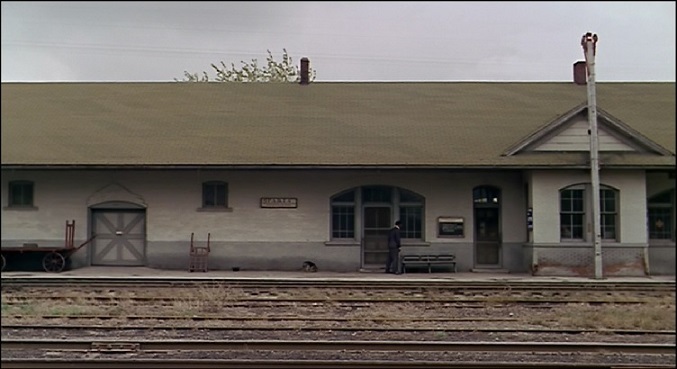 Bellamy’s grocery was across the street from the depot as shown near the end of the film but is gone now. I read that passenger train service ended in Sparta in 1962,years before the movie was made.